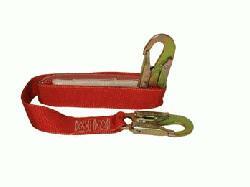 Shock absorbing lanyard may extend a maximum of 3.5 feet when deployed. Snap hooks made of Stamped Steel. Webbing made of nylon. Should a fall occur with the product, the Unit must be removed from service. Maximum capacity 310 lbs, Length 6 feet.